As the United Nations forecasts that the global population will hit 9.7 billion in 2050, scientists warn that industrial agriculture might be reaching its limits to produce enough food to feed a growing population. By some estimates, food production will need to go up by about 60 per cent by 2050 to meet the demand. According to a study by scientists at the University of Nebraska-Lincoln, prevalence of the declines and plateaus in production of major crops since the 1990s indicates that maximum potential yields under the industrial model of agribusiness have already occurred. The researchers argue that some of the causes include land and soil degradation, climate change, and inadequate or inappropriate investment. This raises concerns about whether traditional agricultural methods will be enough to sustain global food production targets as regions which already suffer from malnutrition, water scarcity and soil degradation are forecast to see the largest population growth. Salinity and water scarcity are some of the main growing constraints to agricultural productivity, especially in the Middle East and North Africa (MENA) region. About 20 per cent of the irrigated land is salt-affected. And the increasing urban population is putting more pressure on scarce fresh water resources. Climate change is adding to the problem as the region has experienced an increasing number of droughts. It is estimated that wheat yield losses range from 20 to 40 per cent in salt-affected lands. Scientists argue that non-traditional crops should also be grown more widely in these areas. There are a few crops that are known to withstand heat, water and salinity stresses. But they are not widely cultivated in the region yet. One of them is quinoa, a crop that is believed to hold the key to meeting future food demand. Quinoa, a food crop known only in specific circles until several years ago, has taken center stage as a future-proof solution to global food security. To boost global awareness about the crop, the United Nations even declared 2013 the International Year of Quinoa. In recent years growing global demand has also spurred research and development. However, many research organizations have been studying quinoa for a long time. For example, the International Center for Biosaline Agriculture (ICBA) has been working since 2007 on quinoa in partnership with the Ministry of Climate Change and Environment of the UAE and Abu Dhabi Farmers’ Services Center to evaluate and test the performance of several quinoa cultivars for their productivity when grown in marginal conditions. 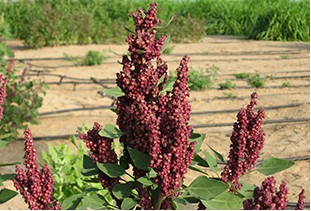 To date ICBA has identified and developed four high-yielding salt- and heat-tolerant quinoa lines that are ready to be tested in other agro-ecological zones. ICBA also leads a global initiative on quinoa to make it a crop of choice for marginal environments. This effort has been running in the UAE, Yemen, Egypt, Jordan, Oman, Uzbekistan, Tajikistan, and Kyrgyzstan. The Food and Agriculture Organization of the United Nations (FAO) has also been at the forefront of quinoa research in the MENA region. For example, FAO has initiated a regional project of technical assistance for the introduction of quinoa and institutionalization of its production in Algeria, Egypt, Iran, Iraq, Lebanon, Mauritania, Sudan, and Yemen. However, there are still many challenges before widespread cultivation takes off. Representatives from ICBA, FAO, the Ministry of Climate Change and Environment of the UAE, and Abu Dhabi Food Control Authority organized a panel discussion at the Global Forum for Innovations in Agriculture (GFIA)-2016, Abu Dhabi, the UAE, to discuss how quinoa can contribute to food security in marginal environments and what is hindering progress in widespread adoption. Speaking at the event on February 17, 2016, Dr. Nanduri K. Rao, Plant Genetic Resources Scientist at ICBA, said that despite the growing global recognition of quinoa's potential, and the favorable results in pilot trials, “we still have to overcome the constraints and issues for its successful introduction and scaling-up in the new/non-traditional growing environments”. According to Dr. Rao, some of the issues include limited availability of genetic material appropriate for cultivation outside its indigenous environment, lack of best management practices for its cultivation, including fertilization, pest and disease control, harvesting and processing in the new regions and areas. There is also lack of local capacity for its cultivation and extension services for transferring knowledge and skills. Dr. Dost Muhammad, regional plant production officer at FAO, reckons it is necessary to do more to raise awareness among local populations. Dr. Muhammad said that the private sector needs to be involved too. But more research is also necessary. With more stimulating policies and government support in the countries, scientists believe it is possible to move things forward. As Dr. Rao said, quinoa shows excellent promise for degraded/salt-affected areas, but to realize its potential more support is needed.